I’m beginning to think it is a requirement for all Parks and Rec cast-members to write books and I am really OK with that. At this point I think Worst Chris, Rashida Jones and Jim O’heir are the only series regulars who haven’t published! Anyway– this review is mostly going to be Parks and Rec gifs. Donna Meagle, expertly played by Retta, was one of my favorite characters on the show once she was given the opportunity to flex her muscles and grow the character. She was effortlessly cool, smart and funny but she was also a full figured woman with a healthy romantic life which is a rarity in televison. In So Close to Being the Sh*t Retta details how she went from a character with a name but no lines to a beloved series regular. While Retta is well aware that “Treat Yo’ Self” will be her legacy Donna Meagle, and Retta, is so much more than that! Retta was born and raised in New Jersey by Liberian immigrants. Money was usually tight but Retta’s parents were constantly letting family members move in with them. As a young woman Retta was a smart and motivated, she’s still smart but she writes a whole essay on how lazy she is now, and she got into several amazing schools after high school. Her parents managed to scrape together the funds for her to go to Duke where she was premed. After college Retta took a year off to study for the MCAT, she worked as a chemist but eventually her life’s ambitions began to change. Retta wanted to star in her own sitcom. I didn’t realize the Retta got her start as a stand up comedienne but it definitely explains her timing and comedic ease. She actually won a Comedy Central stand up comedy contest and toured colleges before landing the role of Donna Meagle. After winning the Comedy Central contest Retta signed with a big agent who collected his commission then basically forgot about her. She bounced around a few other offices but she was actually unrepresented when she auditioned for Parks. When her manager called her a small role on a TV show that wasn’t anything major Retta, who wasn’t getting a lot of work, was just happy for the chance to audition. She went in and the rest is history! But do you wanna know the best part? I didn’t have an agent when I booked Parks. For the next seven years, I did not pay that 10 percent to anyone. To all my former agents: Y’all played yaselves! While she hasn’t gotten her own sitcom yet she transitioned from Parks to Girlfriends’ Guide to Divorce, which I’ve never seen, and Good Girls which co-stars Christina Hendricks and is mildly entertaining. She completed this book before landing that gig but considering she used to live tweet Mad Man I bet that is a pretty good consolation prize to an eponymous sitcom. Retta spills on what it is really like to go to the Emmys and Golden Globes, including the time she called Taylor Swift out for cutting in line in the bathroom, and discusses her addictive personality, laziness and weight struggles. She goes into great detail when discussing her love of handbags, including her prized possession- a Birkin bag she got for a steal ($15,000). But her addictions aren’t limited to fine leather goods, she is also a die-hard LA Kings fan and was an early adopter (and Lin-Manuel Miranda cyber stalker) to cultural phenomena Hamilton. 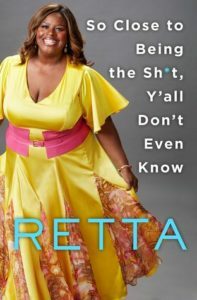 So Close to Being the Sh*t, Y’all Don’t Even Know is a fun, breezy collection of essays about Retta’s time inside and outside Hollywood that fans of Parks or funny women will most likely enjoy. Retta is funny, honest and this is a perfect summer read. Share the post "Treat Yo’ Self to this perfect Summer read"
It’s 60 degrees out, pouring rain, and I’m at my kids swim meet. This review just made my day 800% better. Off to audible! I’m deep into the summer of breezy books. This is queued up next on Audible after I finish the ridiculous H Jon Benjamin memoir. H JON BENJAMIN HAS A BOOK??? Failure is an Option. His life story told in the many, many failures he has accomplished. Now I need to get this and do a Parks and Rec rewatch. After years of mentioning Parks when my dad asked for shows to watch, he finally started it and is now sending me Ron Swanson quotes as he watches! I still have never laughed harder at a TV show than I did at Donna Meagle’s tortured scream upon viewing her bullet-wounded Mercedes. Well now I feel bad!